From a shareholder’s perspective the performance of PepsiCo (NYSE: PEP) stock over the last decade is worth studying for a couple of reasons. Firstly, it encompasses a period in which the start and end valuations aren’t wildly different; freeing us from the effects of a changing valuation multiple and allowing us to concentrate on what you’d call the “business” performance. Secondly, it gives us a clue as to what a lower growth PepsiCo investment might look like in the future. This is useful since many observers use the fact that the likes of PepsiCo are now so large that they can’t possibly deliver good forward returns. In this specific case you’ve also got the healthy eating angle which typically gets a lot of screen real estate on financial media websites. At this point back in 2007 a single share of PepsiCo stock was trading for around $66.50 on forward earnings of $3.38 per share. Additionally, the company had earmarked $1.43 per share by way of cash dividends for its stockholders that year. In other words shareholders were looking at the stock trading at around 20x annual profits with a 2.15% dividend yield. What has happened over the subsequent decade? First of all PepsiCo has generated an absolute mountain of profit courtesy of the scope and power of its brands. In total the figure is somewhere in the region of $60 billion in cumulative net profit. Secondly, PepsiCo has made sure to share a big chunk of that fortune with its owners. Of that $60 billion roughly half was sent to shareholders in the form of cash dividends. A portion of the remainder was also put towards giving long-term investors a higher share of future profits by reducing the share count from around 1.6 billion to 1.4 billion. In addition, shareholders have seen net profit grow from $3.38 per share back in 2007 to $4.36 in 2016. If you back out a bunch of non-recurring items then that figure rises to $4.85 per share for 2016, and should go on to hit it around $5.10 per share in 2017. All-in-all a $10,000 lump sum investment made at this point in 2007 would be worth around $22,750 right now if we assume reinvested dividends. That’s equivalent to annual returns of around 8.5% compared to 6.9% for the S&P 500. 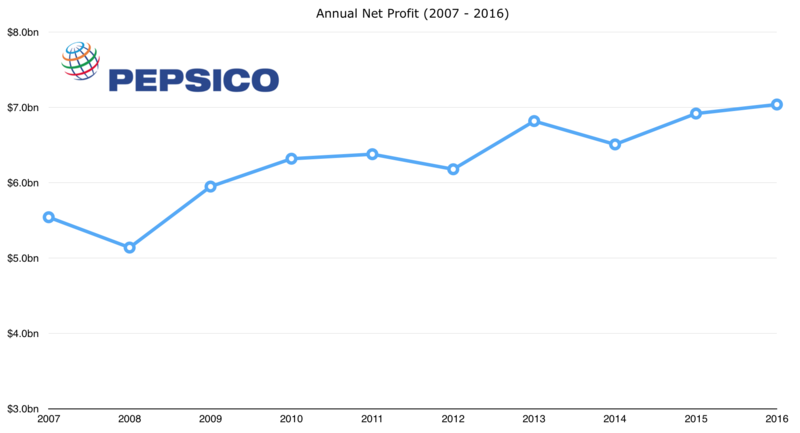 It’s worth noting that the although the majority of that return is down to PepsiCo’s underlying business performance a small portion is due to current investors paying more per unit profit to own the shares compared to those buying in 2007. Even if we back that out of the equation we’re still looking at compound annual returns of 7.2%. The next step is to gauge a realistic scenario for PepsiCo stock going forward. If you were to read PepsiCo articles on Seeking Alpha you’d quickly find two commonly cited headwinds. The first, and something which PepsiCo has in common with 99.9% of other blue chip stocks, is that the current valuation might be too high to provide meaningful future returns. The second is that healthy eating initiatives will become an increasingly strong headwind for a soda and snack food business. On the latter point investors are often guilty of over dramatizing the situation one way or another. For instance, over the last decade headline figures show PepsiCo grew earnings per share by around 3% per annum on average. Not a particularly inspiring figure, but one that has to be taken in the context of the strong US dollar since nearly half of PepsiCo’s business is conducted outside of the United States. In 2016, for example, the foreign currency effect on revenue and earnings was a 3% headwind. Once you back out the non-recurring items then core constant currency earnings per share suddenly shows 9% growth on last year. Currency issues ought to be just as big a talking point as secular trends yet that has not really been the case. The former point is where caution is really required. PepsiCo is currently trading at 22x earnings with a 2.75% forward dividend yield. It’s expensive, albeit perhaps not quite at nosebleed levels. Let’s imagine three scenarios for the long-term investor as to how the situation might play out from here. Each scenario assumes dividend growth will match earnings growth, but the growth rates will be 5%, 6% and 7% per annum respectively over a twenty year period. The final valuation applied to PepsiCo stock in each of the three scenarios will be 15x annual earnings. In the 5% annual growth case you’d end up with annual returns of approximately 4.55%. In other words the ‘punishment’ for for overpaying is a hit of 0.45% per year to total annual returns. Using 6% annual growth you’d come away with compound annual returns of 5.40%, and in the 7% growth scenario you’d see annual returns of 6.30%. As you can see in each case the majority of the returns come from the underlying business performance with a small drag caused by a contracting valuation. Of course these scenarios also factor in a couple of unlikely assumptions. The first is that your entire capital outlay is lumped into the stock on day one compared to a more realistic strategy of cost averaging. The second is that it assumes dividends are just left to pile up somewhere unattended. In reality it’s likely you’d be reinvesting them into more shares of PepsiCo stock or some other cash generative asset(s). Both cases would result in a little boost average annual total returns. Ultimately I think the negativity on PepsiCo is overblown. Forex has been a bigger story than the sugar hype, and the current valuation is a bigger headwind than healthy eating. PepsiCo’s beverage volumes are growing by a couple of percent per annum on a global basis. You also get the higher growing snacks side of the business which includes some world class brands like Lay’s and Walkers. Throw in some longer term factors such as population growth, pricing power, productivity increases and using all that free cash flow to pay dividends/fund buybacks/reduce debt and you’re looking at a robust business performance. All things considered I don’t see why using dollar cost averaging to smooth out the speculative side of things won’t produce acceptable long-term returns.